I haven’t been able to get this dish off my mind since summer tomatoes first appeared at the farmer’s market. Sure, you can make it any time of year, but even quality boxed tomatoes simply don’t compare to sweet, in season Midwest tomatoes. Plus, it’s one of the few dishes I make at home with scallops. And, I love scallops. 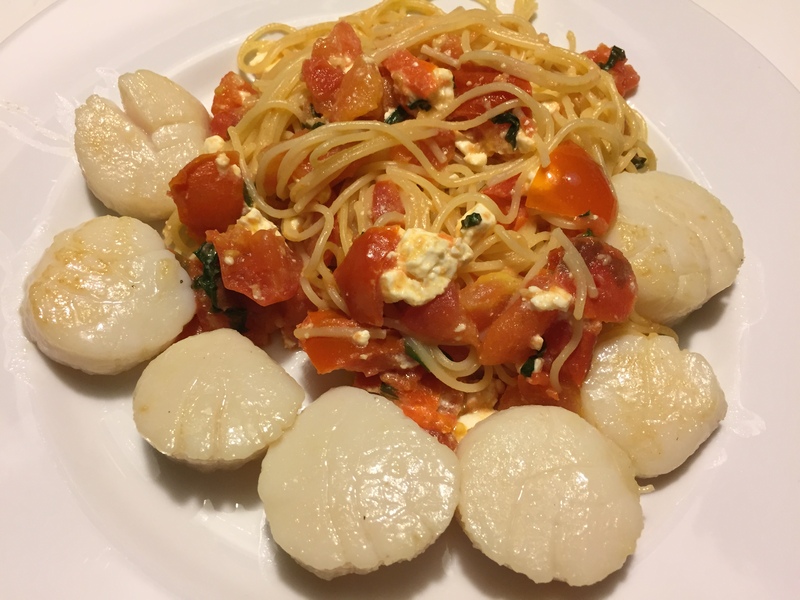 I typically prefer bay scallops for pasta, since the smaller size mixes in well (and that’s how I first had a less evolved version of this dish years ago, at a friend’s house). But Trader Joe’s only had Jumbo sea scallops, which have their own benefits — mainly, you can easily see when they’ve turned opaque. All scallops cook quickly, regardless of size, and I’ve overcooked the little guys in the past by throwing them in with the tomatoes and not paying close enough attention. Since this dish goes quickly, I get everything ready beforehand: chop about a pound and a half of tomatoes; wash, dry and roughly cut a loosely packed cup of fresh basil; pat dry a pound of scallops; mince four cloves of garlic; and put the pasta water on to boil. After sautéing the garlic in about 2 tablespoons of olive oil, I add the basil and the tomatoes. I then move it to the back burner and stir it occasionally for about the next 10 minutes. Five minutes later, I heat about the same amount of olive oil and add the scallops. As soon as they’re in, I throw about three-quarters of a package of angel hair pasta into the boiling water. I time the scallops, flipping them after three minutes. Capellini cooks fast, and at this point is ready to head to the colander. After a couple of quick shakes, I move it to the serving bowl and top it with the tomato mixture. OK, things are about to get a little weird. I add a bunch of crumbled feta. That’s right, feta. Its saltiness goes perfectly with the fresh tomatoes and scallops. I don’t know why. Just trust me. At that point, the scallops are ready. 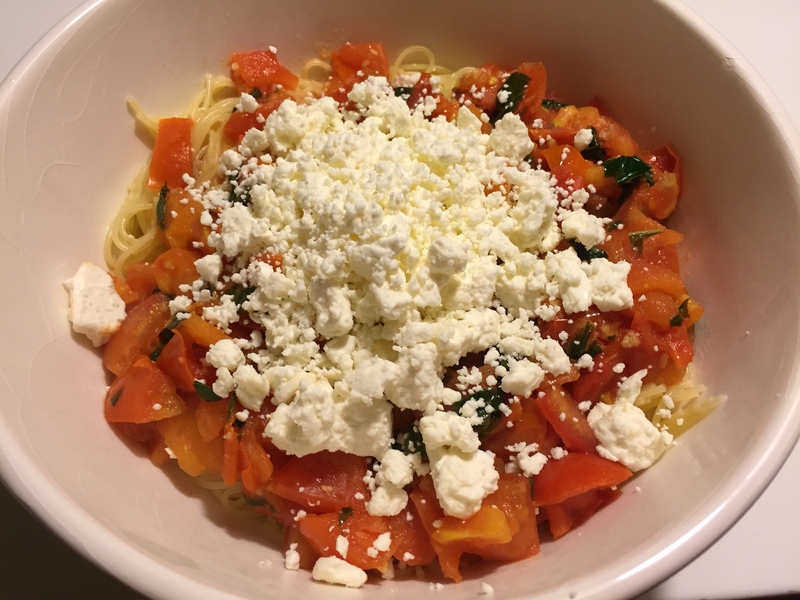 I mix the tomatoes and feta in with the pasta, and plate it with the scallops. p.s. Yeah, it’s been a while. Let’s not talk about it.